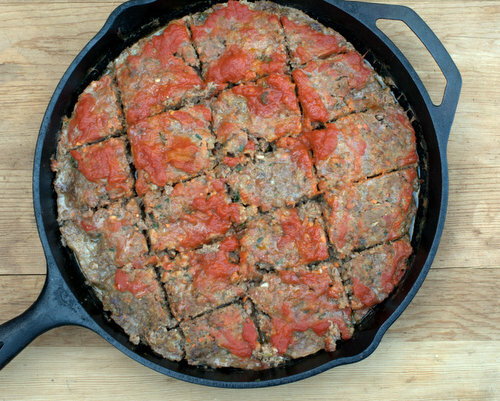 Meatloaf cooked in a cast iron skillet, tender, moist and full of flavor thanks to milk-soaked bread crumbs and a pile of chopped vegetables that texture-wise, "melt" into the meatloaf. This is my go-to recipe for meatloaf, the one I make again and again. Great for meatloaf sandwiches? You bet! But here's a question. Would you (do you?) serve meatloaf for company? Last fall, we invited some people to dinner. My dad's cousin and his wife were in St. Louis from out of town to organize a reunion between her aunt and her uncle, a sister-brother pair, the last of eleven children who grew up on a Missouri hard-scrabble farm. Now know this. Naomi, the aunt, is in her 80s, and Melburne, the uncle, he's 97!! Both are spry and definitely living the good life but I really struggled with what to make for such special guests. It turned out that we had such a good time that night. I swear, the meatloaf had something to do with it! You see, when we sat down that night to a simple weeknight dinner of meatloaf, potatoes and green beans, Naomi flashed a big, big smile – "thrilled" might not be an overstatement. She told us, "This is my very favorite meal!" She even wondered if her niece had secretly told me about her favorites! But it was just my good luck – and maybe good meatloaf! Meatloaf to the rescue! So yeah, sure, many people do love meatloaf. But isn't meatloaf, y'know, kind of every-day food? not something to serve to company? I had such good luck serving meatloaf to our guests last fall, maybe I'm missing something. Where does meatloaf fall in your meal planning, what do you think?! 1/2 cup “something else” – another vegetable, leftover rice, leftover vegetables, mashed sweet potatoes, etc. Set oven to 375F/190C. Get out a 10-inch (25cm) cast iron skillet or another oven-safe skillet. BREAD CRUMBS In a small food processor, blitz bread to form soft, loose crumbs. In a small bowl, combine bread crumbs and milk, let soak at room temperature. VEGETABLES In the same food processor, chop the vegetables until fine. Set aside. MEAT MIXTURE In a large bowl, one big enough to really get your hands into, whisk the eggs, add the eggs, parmesan, 1/3 cup marinara, salt, oregano and pepper. Add the Chopped Vegetables and squeezed Bread Crumbs. With your hands, mix all the ingredients, really working the mixture to distribute all the ingredients evenly. BAKE (COVERED) Gently pack (without pressing hard) the mixture into the skillet. Cover the skillet with foil and bake for 1 hour. BAKE (UNCOVERED) Spread 1 cup marinara across the top. Return to the oven uncovered until meat reaches 160F/70C or is cooked through, 15 - 30 minutes (see TIPS). REST (COVERED) Remove meatloaf from oven, cover with foil and let rest for about 5-10 minutes before slicing. TO SERVE Serve hot with mashed potatoes and green beans. OR GO "DELUXE" Or hey – I haven't thought of this in years but now can't get it out of my brain – go for my childhood favorite, "The Deluxe". Meatloaf mashed into a big pile with mashed potatoes, canned creamed corn and hmm, maybe some cottage cheese cheese too. Mmmm but just a suggestion. ALANNA’S TIPS For bread, any fresh bread works, just make sure it has some heft and good flavor. I’ve used cornbread, rye bread, whole-wheat sandwich bread, you get the idea. When you run the bread through the food processor, don't go so far as "fine" bread crumbs, think the size of panko or grated cauliflower. If you're not eating bread, try cooked rice that's also run through the food processor a bit. For the “something else”, check your fridge, you’ll have something. I’ve used fennel, fresh kale, leftover mashed sweet potatoes, leftover brown rice. Just keep it plant-based. For meat, I use ground beef, ground venison, ground elk or some of each but this mixture would work beautifully with ground turkey as well. Proportion is important! If you have 1/3 more meat, say, be sure to use 1/3 more of the other ingredients. There’s no need to be spot-on precise, just try to stay kinda-sorta close. For example, I know that 1-1/4 pounds of meat perfectly fits a Le Creuset loaf pan we like to use for small, perfect meatloaf slices, that's about 2/3 of 2 pounds so I'll use about 2/3 of the other ingredients. In turn, I know that 3 pounds of meat (1.5 times 2 pounds) perfectly fits an extra-large cast-iron skillet so I'll use half again as much of the other ingredients. Again, without exactitude, honoring the premise and getting close enough. You’ll note that there’s no onion in the vegetables: no onion, no “burpy” meatloaf. For marinara, a jar of commercial marinara works well, so does the “Tomato Gravy” aka Homemade Marinara from Skillet Burgers with Tomato Gravy. It freezes beautifully, just thaw it in the microwave when you first start making the meatloaf. Watch the temperature! A meat thermometer insures that meatloaf doesn’t overcook and dry out. But a recent meatloaf cooked in record time, about 45 minutes, and I have No.Idea.Why. If it weren’t for the thermometer’s alarm, dinner in might have converted to dinner out. NUTRITION INFORMATION Per Serving, assumes 12 servings/8 servings: 231/347 Calories; 11/17g Tot Fat; 5/8g Sat Fat; 110/165mg Cholesterol; 593/890mg Sodium; 7/11g Carb; 1/2g Fiber; 2g Sugar; 22/33g Protein. WEIGHT WATCHERS POINTS Old Points 5/8 & PointsPlus 6/8 & SmartPoints 7/10 & Freestyle 6/8. CALORIE COUNTERS half serving = 115 calories (11g protein).